In last week's Digital Download, we touched on the recommendations from the American Academy of Pediatrics for young children and screen time. Even with guidelines in place, we understand that each family has their own needs, styles and values. Your free time should reflect your personal needs. With this in mind, we want to share a useful tool for all families when it comes to media use! 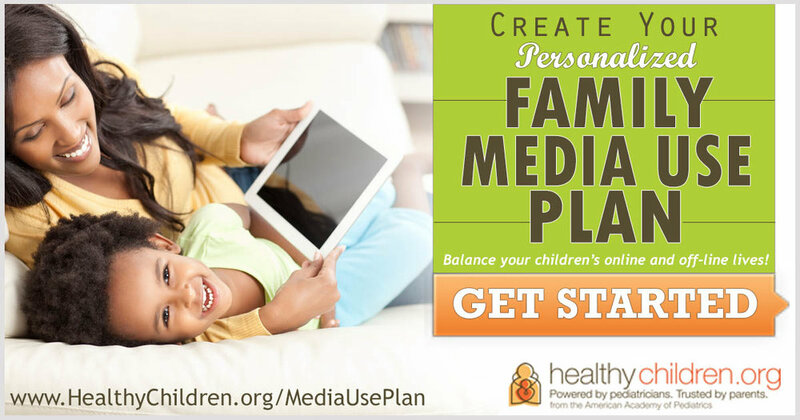 The Healthy Children website, created by the American Academy of Pediatrics, helps families create media guidelines for their family. Media should work for you & work within your family values & parenting style. When media is used thoughtfully & appropriately, media can enhance daily life. But when used inappropriately or without thought, media can displace many important activities such as face-to-face interaction, family-time, outdoor-play, exercise, unplugged downtime & sleep. The website allows you, and your family, to sit down and create rules around media time use. There is also a calculator mode, that allows you to create weekly time frames for almost any activity that might occur in a child's day (e.g. sleep, outdoor play, meal time, media time, physical activity and school). Make YOUR family media plan and share it with all members of your immediate family and support network.